On Monday in Part 1 of this three part housing series, I discussed the housing demand fundamentals from a demographic perspective. 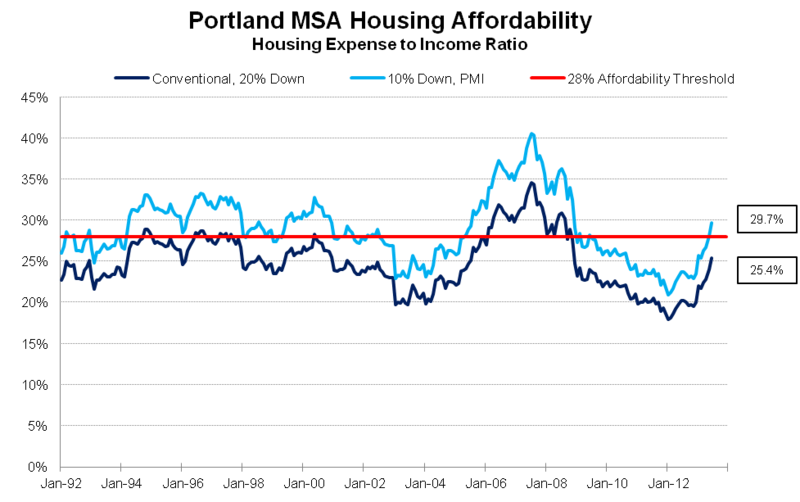 Today in Part 2 I will discuss housing affordability in Portland based on both the existing affordability measures out there and introduce a new measure. Part 3 will take a look at a new and improved version of the housing and related industries for employment. There are a number of different housing affordability measures out there and also a number of different thresholds used to define what is affordable and what is not. Each of these measures tend to use the same data inputs yet result in a somewhat different measure of affordability. The National Association of Realtors’ Housing Affordability Index uses 25% of income for principal and interest as their barometer of affordability while assuming a 20% down payment on a conventional 30 year loan. So far, so good, however they then turn these figures into an index that measures what percentage of the median home the median family can buy. A value of 120 means the median family can afford 120% of the median home price while a value of 80 means the median family can afford 80% of the median home. This can be somewhat confusing as what exactly does 80% of the median home mean? What does that mean for a family looking to purchase today? The National Association of Home Builders Housing Opportunity Index uses 28% of income spent on principal and interest (30 yr fixed, 10% down) plus estimated property taxes and insurance. Again, so far, so good. The NAHB then looks at all the homes sold and calculates the percentage of sales that are affordable at this threshold. So a value of 70 indicates that 70% of the homes sold that month were affordable to the median family. The differences here when compared to the NAR are certainly useful items to know and the NAHB does include both new and existing home sales and does not assume a 20% down payment which can be high threshold, particularly for first-time home buyers. However, such a measure can still be a little confusing for families looking to purchase today or for those not well versed in all these numbers and nuances to the measures. Being able to purchase the majority of homes out there is good to know that you have more to choose from but what exactly does that mean for your costs? Finally, the U.S. Department of Housing and Urban Development uses the 30% threshold for housing costs as affordable but does not create affordability measures, while Zillow uses an overall debt burden threshold of 36% of income but that includes non-housing debt as well. What I propose as a measure of housing affordability is to use these same general data inputs as above, however examine housing costs as a share of income without turning the data into an index. Overall an index is very useful when gauging trends over time and comparing different periods of history. However, saying that the median family can afford 115% of the median home price or they can afford 60% of all homes sold does not tell me much about what it costs today to purchase and afford a home. By examining just the ratio of the median housing costs to the median family income, it allows for a more intuitive understanding of the current state of home sales. Does not include utility costs or remodels. A few notes about these components. I am using Washington County’s average residential property tax rate as a proxy for the whole metro even as each county does differ somewhat from the next (some higher, some lower). The AHS does include averages for homeowners insurance and property taxes however the survey for Portland is sporadic and only available for 1990, 1995, 2002 and 2011. Using the data I do provides more timely coverage and updates to changes, however it is easy to check the 2011 figures for direct comparisons. Using Washington County’s residential property tax and the median sale price I get $2,649 in property taxes while the AHS shows $2,700. Similarly for homeowners insurance I use $542 for 2011 while the AHS shows $540. These results are nearly identical. I am continuing with the 28% threshold as affordable however your mileage may vary. 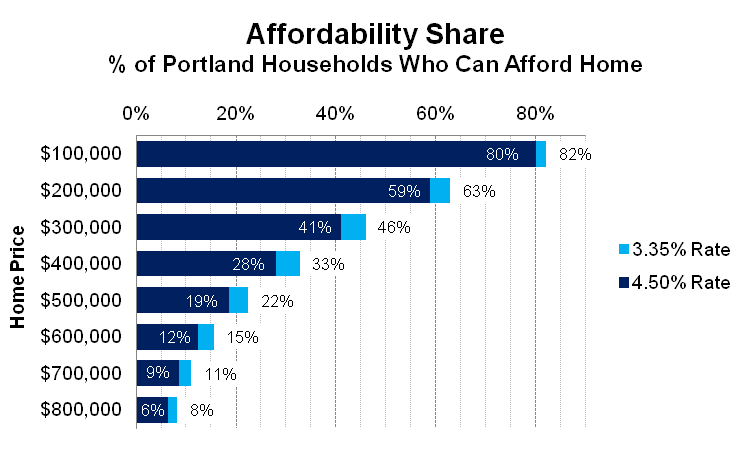 The HUD threshold of 30% is supposed to include utility costs as well, which are $100-200 based on the latest AHS for Portland which would increase the percentage by another 2-3.5%. Stepping back and looking at the entire time period it shows that housing in Portland was affordable, if just barely so, during the 1990s which was a strong economic, income and population growth decade. Following the dotcom crash and at that time unprecedented low interest rates, affordability improved substantially through 2002. However as interest rates climbed and home prices skyrocketed through 2007, purchasing a home became increasingly unaffordable even for those families able to put 20% down. We also know during this time that NINJA loans were more prevalent as were adjustable rate mortgages, both of which were used to lower the threshold to buying for many individuals and families who would otherwise could not afford ownership at those prices. Following the housing crash with plummeting prices and historically low interest rates (not to mention a collapsing global economy), housing affordability improved considerably in 2009 and though 2011. However, as shown above the percentage of the median family’s income needed to finance the median home sold has increased substantially so far in 2013. At the end of 2012 a family who could afford to put 20% down on a new home would spend just 20.1% of their income on their home while a family able to put 10% down plus pay mortgage insurance would spend 23.6% of their income. Fast forward to June 2013 when prices have risen considerably (from December’s $247,900 to June’s $272,000) and interest rates have jumped as well from 3.35% to 4.07%. Breaking down these changes arithmetically, 47% of this increase in housing costs is due to rising home prices while 53% is due to higher interest rates, however it is close to 50-50. Both of these changes results in higher financing and ownership costs for new purchases. With all this being said there are still a few issues with affordability measures like the above. First, it is useful to know what the cost of ownership is given the current state of the housing market however it still does not address the fact whether or not the median family can afford to buy or qualify for financing. These measures tend to be more linked with whether housing is a good investment and not whether more people are actually able to afford and finance homes. It has become significantly harder to obtain a mortgage in recent years so even as these affordability measures are flashing bright green; not as many people can qualify nor can they sell an underwater mortgage they may already own or even refinance at the lower interest rates. Second, while I am able to include routine maintenance costs in the index, from a personal perspective, they appear to be too low. According to the AHS in 2011 the estimated monthly cost for routine maintenance was $33 or $396 per year. In the 2002 survey it was $26 per month. As a homeowner I know I spend a lot more per month than this on basic maintenance and upkeep. It is also important to keep in mind that costs like this are included in rent for non-owners. Third, these measures use income as a proxy for ability to pay and do not account for wealth which is a particular distortion for older and retired households. While no individual measure of the housing market can perfectly explain the current conditions, the above tries to make an intuitive measure of affordability. Knowing the share of income needed to reasonably own and finance a home is certainly important for owners and families. However additional information such as the NAHB’s calculation of the percentage of all homes sold that meets similar thresholds is also useful. Stay tuned for Part 3 of the series that examines a new and improved measure of housing and related industries employment. Addendum: Based on an inquiry, the following provides an estimate on how households within the Portland MSA have been affected by the interest rate increases. I am using the latest 5 Year ACS data for the Oregon portion of the MSA which estimates there are approximately 698,400 households in the region. Applying the same methodology as above and using the 28% of income threshold, the graph below shows what percentage of these households can afford a home priced at different levels. The light blue lines and percentages to the right indicate what share of households could afford a home when interest rates were at 3.35% at the end of 2012. Taking into account that interest rates today are averaging 4.5%, the dark blue lines illustrate what share of the region’s households can afford homes today. The rise in interest rates alone does impact affordability. An example: At lower interest rates 63% of the region’s households could afford a house priced at $200,000, while the rise in interest rates seen in recent months means today only about 59% of households could afford the same $200,000 home. In actual numbers this translates into nearly 29,000 households being priced out. At the $300,000 price level it represents a decline of over 34,000 households. While obviously not all household are looking to move or buy or could even qualify for a mortgage these days, it does represent a decrease in potential demand for homeownership due to just interest rate changes alone. We recommend you review the Housing Vacancies and Homeownership statistics, available from the U.S. Census Bureau at http://www.census.gov/hhes/www/housing/hvs/hvs.html .